Candice Rossie at Fraser Yachts tells me that Antoine Larricq in the Monaco office has joined Gaspard Milazzo of Gaspard Yachts as a joint central agent for the sale of Palmer Johnson's 36.58m Vanquish. Built in 2005, she sleeps eight guests in a master, two doubles and one twin and her fast planing hull is capable of cruising at 24 knots. 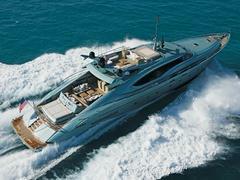 Lloyds classed and MCA compliant, Vanquish is asking €10.9 million.